Janet Winston had a rash that wouldn't go away. 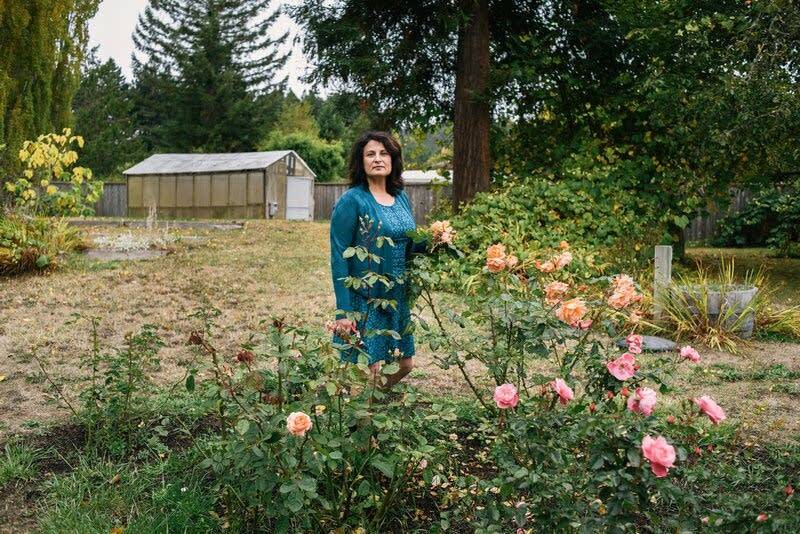 Winston, 56, who works at Humboldt State University, found out the dermatologist in her rural Northern California town was booked months in advance. So, as Winston often does for specialized treatment, she turned to Stanford Health Care, a nearly six-hour drive south. She hoped to finally clear up her rash and learn what else she might be allergic to. Winston, who had avoided lipstick and other skin products for years, said that 119 tiny plastic containers of allergens were taped to her back over three days of testing. Winston ultimately learned that she was allergic to — among other things — linalool (a compound of lavender and other plants); the ketoconazole cream prescribed to treat her persistent rash; the antibiotic neomycin; a clothing dye; a common preservative used in cosmetics; and the metals gold, nickel and cobalt. Medical procedures: Extensive allergy skin-patch testing to determine which substances caused Winston's contact dermatitis, or skin rashes. "I was grateful I had such wonderful care at Stanford, but I was pretty outraged they could charge that," Winston said. "No one cut into me. No one gave me anesthesia. I had partly open plastic containers filled with fluid taped to my back." Stanford's list price, however, is $399 per allergen. Winston's case highlights how some health providers set exorbitant rates, knowing they'll ultimately be paid a lesser amount. Patients rarely pay these rates — known as "chargemaster" or list prices — and they can generate headlines for the $100 aspirin. But such list prices, as the starting point for negotiations and discounts, do influence the amounts insurers pay, and ultimately what patients pay as their share of cost. Stanford Health Care also has a lot of power in dealing with insurers like Anthem Blue Cross. The academic medical system includes hospitals and outpatient clinics across the San Francisco Bay Area, as well as a number of large doctor practices in the region. That kind of consolidation and market power can raise health care prices. Insurers in the region have long grappled with Stanford's high costs, at times withdrawing the health system from their networks. But the breadth and depth of the academic medical system — not to mention its popularity with high-end customers in the Bay Area — makes it difficult for insurers to exclude a powerhouse like Stanford from a network for long. Leemore Dafny, a Harvard University health care economist, said big health systems such as Stanford's — which owns multiple hospitals and outpatient clinics — can pressure insurers to pay big. Resolution: After some bargaining with Stanford's billing department, Winston ultimately paid $1,561.86 out of pocket. She made the argument that her doctor had told her the cost per allergen would be about $100, not nearly the $400 Stanford ultimately charged her insurer. The takeaway: Insurers often tell patients to "shop around" for the best price and to make sure they choose in-network providers to avoid surprises. Winston did everything right and still got caught out. As a state employee, she had great insurance and Stanford was an in-network provider. Winston said her doctor warned her the test would be expensive, but she never anticipated that could mean close to $50,000. So don't be afraid to ask for specific numbers. In the high-priced U.S. health system, "expensive" and "cheap" often take on entirely different meanings than those in everyday life. Clearly uncomfortable with the charges, Winston's physician advised her — in advance — to contest it with Stanford's billing department. So Winston did, and Stanford gave her a nearly 50 percent discount for her coinsurance share of the bill. It never hurts to ask. Still, Stanford received more than $12,000 total from Winston and her insurer for allergy-patch tests — a cost that is borne by insurance policyholders and taxpayers. Researchers have linked consolidation by Northern California providers such as Stanford and Sutter Health to higher health costs for the region's consumers. A local health workers union also has taken aim at Stanford's costs with two city ballot initiatives that attempt to rein in what Stanford and other health providers can charge patients in Palo Alto and Livermore. If you'd like us to consider your medical bill for a future story, you submit it here. You can follow Barbara Feder Ostrov on Twitter: @barbfederostrov. April Dembosky, from member station KQED, provided audio reporting. NPR produced and edited the interview with Elisabeth Rosenthal for broadcast.